Harold Fry is recently retired, living alone with his wife who can barely tolerate him. One day he gets a letter in the mail from a former coworker. She is near the end of her life, in hospice care after a battle with cancer. Harold is so moved by this letter, from a woman he knew so long ago, that he decides to reply. He puts the letter in his pocket, slips on his shoes, and tells his wife he is going to the mailbox. However, when he gets to the mailbox, he doesn’t stop walking. He goes to the next mailbox, and the next, past the post office and keeps going. He doesn’t want to stop. Eventually Harold is hungry and stops at a garage for a burger. There he meets a young woman who tells him about the healing power of belief and faith. Harold makes a big decision. He will walk to Queenie and she will not die before he gets there. He calls the hospice and leaves a message for Queenie to wait for him. The journey is difficult. Harold’s wife doesn’t believe he’ll make it a day. His only exercise has been to walk to and from the car. He doesn’t have proper shoes or equipment. 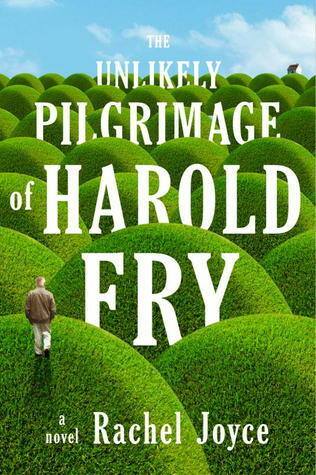 But with positive thinking and support from strangers, Harold’s pilgrimage turns into a life-changing journey for many. I love a good travel book where I can entertain my fantasy of breaking away from the everyday monotony of life. Harold’s journey shows that it’s never too late to make changes in life and that sometimes it takes a change of scenery to put things in perspective. This is a quiet story of redemption and forgiveness.